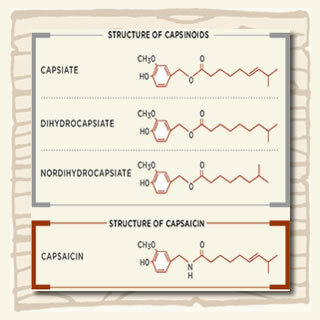 The cells which contain the capsaicin have a high internal pressure so that when the chilli is broken or sliced open they burst, spraying the chemical over the inside of the pod. 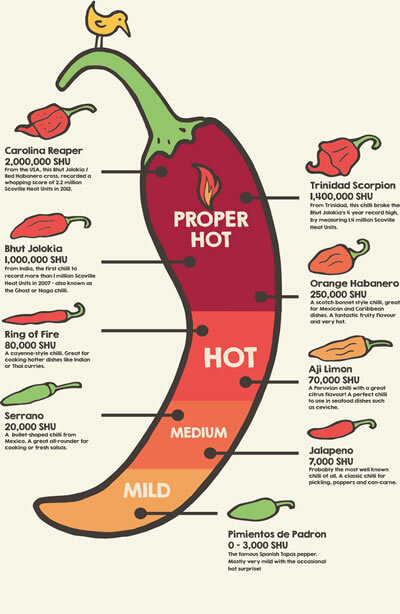 Heat is traditionally measured in Scoville Heat Units (SHU), devised by Mr Wilbur Scoville. The principle was that a whole chilli was blended into sugar water and then diluted until it was no longer detectable by taste. This is a bit of a hit and miss process, so nowadays "Scoville Tests" are done using liquid chromatography and translated back into Scoville Heat Units. The best antidote to heat is either patience, or a dairy product such as milk or yoghurt. Try to hold the yoghurt in your mouth for as long as possible before swallowing. Sugar also seems to reduce the heat sensation a little. Drinking water or beer does not help as they wash the heat further into your taste buds. Apart from the heat of chillies, the wide range of chillies we grow are very different in flavour. The same chilli even has a different flavour when fresh to when it is dried; for example a fresh Aji Limon chilli tastes lemony but a dried Aji Limon tastes of banana! Chillies have a range of uses depending on their size, colour, fleshiness, flavour. Thinner skinned chillies are easier to dry; thicker fleshed chillies are good for stuffing and baking; small chillies are good to use whole; long chillies are easy to chop. See our online fresh chilli selection (seasonal) and recipes for more information on the uses for each chilli. The flavours that chillies develop when dried is always surprising us! When tasting a fresh chilli, it is difficult to predict the amazing flavours that develop during the drying process! Dried chillies can be reconstituted by covering them in boiling water and leaving them to stand for 20 minutes or so. They can then be mixed into a dish as they are or blended before adding. Some (like Ancho and Mulato chillies) have quite thick skins, so may need pushing through a sieve to remove the tough parts of the skin. We recommend storing dried chillies whole, rather than grinding them to powder of flakes - powder can quickly lose the wonderful aromas and flavours so it is best to grind them to powder as you need it. Drying chillies that you have grown is a great way to store them (ideally in a jar or tin, and in a dark, cool cupboard) and they will develop great flavours as they dry. To dry chillies, select the thinner-skinned varieties and place them somewhere warm and well ventilated. Dry them until they are firm with no soft parts, and then store in a jar or tin. "Chilli" or "Chile" - The choice is yours, "chile" is the more usual spelling in the USA, and "chilli" is generally accepted as the correct UK spelling. You may also see "chili" which is also used in the USA. We have decided to use the UK spelling since that is where we are, but you may occasionally catch us using "chile".